Compared to some other major cities around the world, Barcelona is not a very large city. Yet, there are tons of things to see and do in and out of this historic seaside city in Spain. But say you are limited on time. What if you only had four full days to explore all you can, what is worth your time to see, and what isn’t? Are there better places to see, and things to do? It’s important to know that the famous sites in Barcelona are spread out across the city. Finding the perfect hotel that can work as your base camp will help you see and do more. After all, you don’t want to spend most of your time on the Metro, or in a taxi. But you will want to sightsee and explore without wasting too much time or money going to the places on your must see list. So, to begin, we need to find you the perfect spot to stay. First, you have to understand that Barcelona is split up into distinct districts or neighborhoods. About the city, you will find ten big neighborhoods and half a dozen districts within those neighborhoods. Out of the 10 neighborhoods, only five are worth your time. The ones you should steer clear of are Sant Andreu, Horta-Guinardo, Sants-Montjuic, Sant Marti, and Nou Barris. So, what neighborhood should you stay in? Out of the remaining five, you should probably stick to El Gotic, Eixample, and Gracia. The other two are expensive and outside the central area of Barcelona. When it comes to encompassing the ideals of Barcelona, El Gotic is the place to be. It is the oldest part of the city as was originally an Iberian city before it became Roman Barcino. The streets are dark and narrow as the building shroud the sunlight. But don’t let that intimidate you. El Gotic, is rich with history and is the place to be to see some of the most beautiful buildings Barcelona has to offer. Due to the nature of the streets, you will find walking the best form of transportation. Many cars or busses cannot squeeze into the narrow pathways. However, walking through this historical district will allow you to come across the Portal de l’Angel, the Cathedral, La Placa de Sant Jaume, and La Placa del Pi. Here within this neighborhood you may find yourself gazing on ancient remains of Barcino, Portafeeissa. Within El Gotic, you will find several unique and fascinating boutique luxury hotels. When it comes to an ideal stay, you will find Hotel Neri one of the top places to stay. Long velvet curtains will pull you back to days of old. From the balcony of some hotel rooms, you may even spy indents in the 2,000-year-old walls where bullets and shrapnel nicked the walls of the Neri Church during the Civil War. If you are looking for simplicity and easy to navigate area, then look no further than Eixample. Here you will find everything you need. Eixample is where many of the five-star hotels reside in Barcelona. You will also find two of Gaudi’s most iconic buildings are located, the La Pedrera and Casa Batllo along with some more prominent landmarks. The Mandarin Oriental offers visitors a modern flair infused with the mystery of the East. The building itself is a wonder to behold as it is somewhat of a maze. However, if you are looking for class and elegance, you will find it here at the Mandarin Oriental. Perhaps you are looking for a quieter place to vacation. Gracia offers the traveler a ‘small towna ‘ feel despite being located in the heart of Barcelona. It is remarkable how Gracia remains unaffected by the tourist industry. The only major tourist attraction in this neighborhood is Park Guell in the northern part of the district. However, if you are looking for a comfortable, laid back area, this would be it. So where to stay? Casa Fuster is the only hotel worth staying at in this area. It is a beautiful building that has been declared by UNESCO a World Heritage Site. The building itself dates back to 1908 but renovated in 2004. You will find Casa Fuster nestled between Gracia and Eixample. 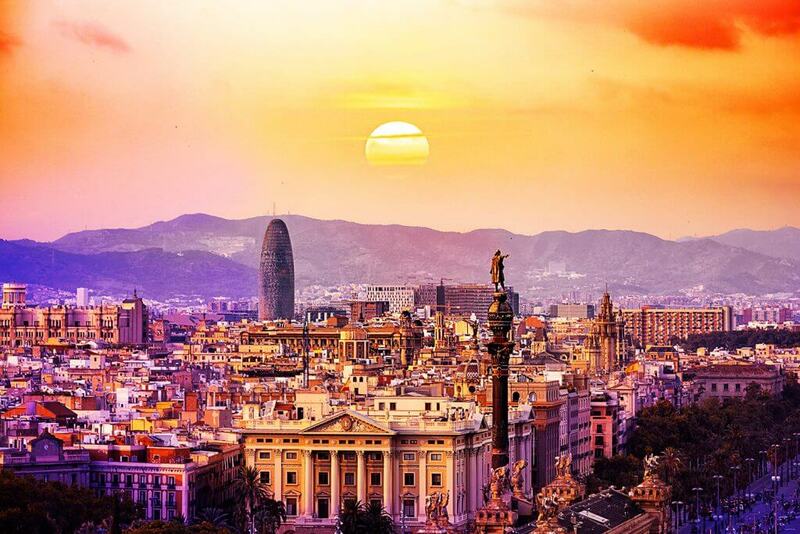 Within Barcelona you will find an array of things to see and do. But being limited on time, there is no way for you to see everything. The city offers too much for a weekend traveler. But here are a few notable spots for you to check out on your four day adventure in Barcelona. The La Sagrada Familia is a church located in that began its construction in 1882. According to many sites, the date for its completion will not be until 2020. Although it is considered to be under constant construction, tourists and locals can visit this grand building that is set be the tallest church in Europe. Now, there is some speculation on whether you should take a tour to see the marvels within the church walls that are open. This is entirely up to you. Some say it is not worth seeing the inside as most of the church is blocked off. While others say it is worth seeing the different architecture wonders within the walls. When taking the tour, there are a few things you should be aware of. The first is that there is a tomb on the lower level. Here, you will find the resting place of Antoni Gaudi, the original architect himself. But while viewing the splendor within this place and marveling at the stain glass windows, don’t forget to pay close attention to the pillars. There are pillars within the church that resemble trees which hold up the ceiling. And when you gaze up at them, you will notice they change just as trees in nature do. Below these pillars you will also find a turtle and a tortoise that are a symbolic representation of the earth and sea. Granted there are a number of reasons to visit inside the church. If you do plan to go inside and tour, order your tickets online and skip the line. Expect to spend at least 3 hours here viewing everything and pick a time early in the morning when it first opens to avoid heavy crowds. However, if you are looking to save a few euros, the grounds around La Sagrada Familia offer enough marvel and awe inspired pictures without spending money on the tour. Traveling around the grounds only takes about 15 to 30 minutes. One of the most well-known streets and attractions in Barcelona is Las Ramblas. Here you will find more than 300 stalls offering a variety of things from food, to clothing and a bit of the unusual. While wondering down this street keep your eyes open for Canaletes Fountain, Liceu Opera House, Teatre Principal and the Boqueria Market. Las Ramblas starts at Plaza Catalunya and ends at the Columbus Monument. The Columbus Monument is a sight to see all in itself. The huge structure is a tribute to Columbus opening the channels to the Americas. No matter which way you turn on Las Ramblas street, you are sure to find something interesting. Strolling through the street requires good shoes and loose clothing. Expect to take a few hours to see everything and another hour for tasting the food you will find strolling through this area. The fountain in the center of the city is a site to see when the sun goes down. The water shoots high into the sky in sync with music and lights. It is free to see and is one of the last Internation Exposition attractions built in 1929. The Magic Fountain is perfect for a romantic setting or families with children. No matter your age though, you will find the wonders of the fountain inspirational and taps into the imagination of everyone who watches the show. The show isn’t very long, but is worth watching with a cup of authentic hot chocolate and tapas in your hand. When it comes to exploring the melting pot that is Barcelona, then stopping by Horta should be on your list of things to see. Here you will find an incredible maze that resides in the oldest park in Barcelona. Here you will be in awe at the neoclassical 18-century garden that blends majestically into a 19th-century romantic garden complete with mythical Greek character statues and sculptures. Although Montjuic is outside the city limits, it is well worth traveling to. Here amongst the parks and gardens you will find a castle that was once a fortress that has turned into a military museum. Be on the look out for the Gardens of Mossèn Cinto Verdaguer, Albéniz Mansion, and especially Gardens of Laribal. While there is plenty to see simply roaming the streets of Barcelona, some of the more treasured artifacts found in the Museums. Barcelona offers both modern and classic Museums to explore so which ones to pick? Starting off, you should visit The Museu Picasso of Barcelona. Here you will find the largest collection of Pablo Picasso and view over 4,355 works by this native artist. If you are looking to stroll through history until you get to the modern world, you won’t find a better place than the Museu Nacional. Here you will find art ranging from the 12th-century all the way up to 1950s. The museum features the biggest and oldest collections of paintings presented on wood in all of Europe. In 2014, the modern floor was re-opened and showcases paintings, sculptures, posters, architecture and other decorative art pieces. For any art lover, Museu Nacional is the place to go. Expect to spend several hours to fully appriciate the different pieces found within these walls. However, if you prefer to bypass the old stuff and stick with modern works of art, there is no better place than Fundacio Antoni Tapies. Here you will find an entire museum dedicated to promoting modern art. This museum offers not only temporary exhibitions but also organizes activities for those looking to explore and emersed themselves in contemporary artwork. So, now that you have an idea of what Barcelona has to offer, what can you see in just four days? Well, quiet a bit actually. Even though you only have a few short days here, you will find this Itinerary chalked full of sights and sounds that is sure to leave you with tons of memories. You should start your first full day submerging yourself in the culture and the area. Staying in the heart of the city like El Gotic is the perfect place to begin your adventure. Here you can spend your morning wandering through the narrow streets and passages of El Gotic. Don’t forget to stop in and see the Museum of the City, the ancient ruins of Barcino Portaferrissa along with the Viceroy’s Palace. Also look for Once you make it out to the center, you can simply hop on the Metro and go to any destination of your choice. In the afternoon, after you have had a decent meal at one of the local shops, take the Metro to La Sagrada Familia. Don’t feel pressured to go inside, just marvel at the structure and walk around the grounds. You are sure to see enough of the majestic building without spending money on the tour. Of course if you do want to see inside, be sure to purchase tickets in advance and skip the line. The evening should be spent relaxing by the beach and soaking in the last rays of the day. There are plenty of shops to stumble into on the strip, and even more places to eat. The second day of your trip will be fun and exciting as you jump on the metro to take you to the central square Plaza Catalunya which also begins Las Ramblas Street. Here you can walk about taking in the splendors of the people and shops that surround you. Be sure to grab a delicious cup of joe and breakfast at one of the shops here. The delicacies are far beyond anything you can imagine. Come midday, you are most likely wanting to get out of the heat. Barcelona is muggy due to it being a coastal city. The best place to go is Museu Nacional (MNAC). Here you can spend hours touring through the past as you soak in the artwork. When the heat begins to wane, you might consider having a bit of fun. That is where you can jump back on the Metro and head to Tibidabo Hill. Tibidabo Hill offers fantastic views of the city along with a small vintage amusement park that is open during spring and summer months. Don’t forget to check out the stunning the Sagrat Cor church on Tibidabo hill which is open all day and free to visit. When evening comes, you can stroll through the city before jumping on the Metro to get to the Magic Fountain. There you can take in the sight and sounds of the water show. Starting your day off you need to head to Horta Labyrinth and get lost in the maze. Stroll through the gardens surrounding the Desvalls mansion and take in the fountains and sculptures of the mythical characters from days past. In the afternoon, find yourself emerged in art as you stroll through Fundacio Antoni Tapies. Here you will find a collection of modern art and history emerging under one roof. And in the evening a trip to the beach is a must. With nearly 4.5 miles of beach to stroll down, and shops along the boardwalk, you are sure to find souvenir to take back home. Today is the final day of your adventure and you should end it with a bang. A day trip to Montjuic is the perfect antidote. About an hour outside Barcelona city limits, you will find history, art, and gardens galore. Visit the waterfall in the Gardens of Laribal and spend time touring the military museum during the hot afternoon. Finish off the day at Caseta del Migdia with the city of Barcelona spread out at your feet while reminiscing on all you have seen before taking the hour trip back to your hotel. The best form of travel is walking. However, many of the sites are spread far apart and would take hours getting there. Luckily, Barcelona has one of the best Metro systems in Europe. The Metro consists of twelve lines and can be traveled with a standard metro ticket. The two main logos to look out for when traveling is TMB (Transports Metropolitans de Barcelona) which manages lines L1-L5, and L9-11, and FGC (Ferrocarrils de la Generalitat de Catalunya) which handles lines L6 to L8 and L12. The metro lines are open Monday through Saturday at 5am. On week nights (Monday through Thursday) they close at midnight. On Friday the metro is open until 2am and Saturday and Sunday are open all hours. Of course the time does differ from holiday hours. Take Christmas Eve for example, which the metro closes at 11 pm. The metro stops every 2 to 4 minutes, but at night wait times can reach up to ten minutes. The easiest thing to do is purchase a Barcelona card. This card will allow you to travel unlimited times on any line. Or you can purchase the Barcelona City Pass which offers more perks like access to Sagrada Familia, Park Güell and includes a ticket for the Hop-On Hop-Off tourist bus. You can get the Barcelona City Pass for €74 per person. However, you can grab a single ticket for each trip you but you are looking at a cost of 2.20 euros per ticket. The main lines to take are L1, L2, and L3. These three lines will connect to each of the outer lines and will get you anywhere in the city. Line 1 which is indicated in Red, crosses the entire city from east to west. You will find many of the attractions on this line. It connects with the yellow, green, purple, and blue lines. Line 2 is indicated in Violet and will get you to the main points of interest like Sagrada Familia with main connections to yellow, green, blue and red. Line 3 is green and offers three stops along the Rambla with stops near Park Güell, and Parc de Labyrinthe de Horta. The main connections for Line 3 is blue (at a diagonal), red, yellow, and violet. Where the metro can’t go, a bus is sure to take you. That is why getting a City Pass will save you a lot of money. While Barcelona is an amazing city to see, there are a few things you need to be aware of before going. Most of the city is safe, but there are several places where pick-pocketers are known to flock to. These places are the tourist spots like Sagrada Familia and the beach. Keep your bags and wallets close. It would be wise to ensure you don’t travel with all your money. Bring with you only what you need for the day and keep it separated from your wallet. That way if you do end up getting pick-pocketed, then at least you still have money to go about your vacation. This also implies to cameras and purses. Don’t carry these items randomly thrown around your neck. Pick-pocketers are crafty and will cut the strap leaving you wondering what happened. It is also important to make a copy of your passport and leave the real one at your hotel. That way you have something to show merchants when using your credit card, but if you get pick-pocketed, you won’t lose that important document. In most cities there is the option of taking a cab to where ever you want to go. But in Barcelona, you have the chase of spending far more than it is worth. The metro and bus system throughout the city is far cheaper and can get you anywhere you want to go. There is one tradition that still holds true for the people in Barcelona. If by chance you are asked to pass the salt, make sure to place it on the table in front of the one asking. Never wait for the person to take it from you. The superstition states that it is bad luck and may cause the people to quarrel. Even though it is just a superstition that maybe out dated, it is always best to do as the locals do. Be sure to do some homework before picking a flight to Barcelona. Many of the airlines claim they fly to the city, but in fact their airports are far from the city proper. If you fly into Girona or Reus, expect to spend an hour getting from the airport to the city. If you are coming to Barcelona for a good time and like to experience the nightlife, remember that most places open late. Parties in Barcelona usually don’t begin until well after midnight. While Barcelona is a city by the sea, the locals do not wear their swimsuits in the city limits. Nor will you find them wearing heavy denim. If you want to blend in and not look like such a tourist, dress as the locals do. Light fabrics, no shorts for men, and sandals are the norm. Barcelona offers tons of things to see and do. The best way to see this city is by getting lost and finding yourself. Whether you are going to see history, or to immerse yourself in a new culture, Barcelona has everything you need to have a great time. Best Things to do in Berlin: 4 Days Itinerary. Our Travel Guide. Top things to do in Vienna: 4 days itinerary. Our travel guide. The Best Things To Do in Milan. Our informative guide. Four days in Paris: the best places to visit. Our travel guide. Copyright WILL TO FLY © All rights reserved. All contents are property of WILL TO FLY. This content is the property of Will To Fly. The copy is prohibited by the law on intellectual property.